Join The Weekend online community. Help us Make This Weekend Matter during the month of April! Listen to news about The Bigger and Bolder Weekend Podcast. Listen to the Fundraising Podcast. Listen to the Team Building Podcast. Listen to the Cold Weather Training Podcast. 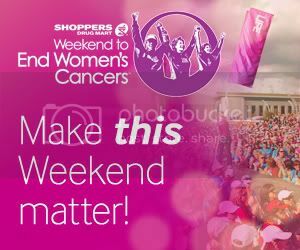 Help us spread the word about The Weekend by putting a banner on your blog or website. Adding the email badge will help extend your fundraising efforts to all your contacts you email every day! Personalized just for you, the email badge will show your contacts your fundraising goal and progress, and link directly to your personal page. The email badge is compatible with all email programs and can be placed on multiple accounts. To add your personal Weekend badge to your email signature, login to your Participant Centre and follow the 1-2-3 instructions listed. The Facebook application is designed to increase your fundraising by driving donations via Facebook with help from your Facebook friends and community. When you download the application from your Participant Centre, you will be directed to an interactive Weekend canvas page letting you donate your profile picture, send a stream story and share your personal story. The stream stories will update on all your friends’ news feeds and link them directly to donate to your fundraising. Login to your Participant Centre to download the application and start fundraising on Facebook today. The new Weekend iPhone application allows you to login to your Participant Centre directly from your iPhone. It’s a great tool for tracking your fundraising progress and to keep you current on all Weekend news! Within the iPhone app you can update your personal page including adding a photo directly from your iPhone, send emails to friends and family, follow our Twitter feed and watch yourself get closer and closer to your fundraising goal! Download the new app for free from the App Store. Subscribe to The Ottawa Weekend RSS feed. Subscribe to The Weekend Twitter feed.